A $1.6 bln bond that becomes equity is a cheap way for Elon Musk’s electric carmaker to raise cash for its new Gigafactory. Hedge funds love such securities, which provide unique trading opportunities on volatile stocks. And lately they’ve been almost as hard to buy as a Tesla. 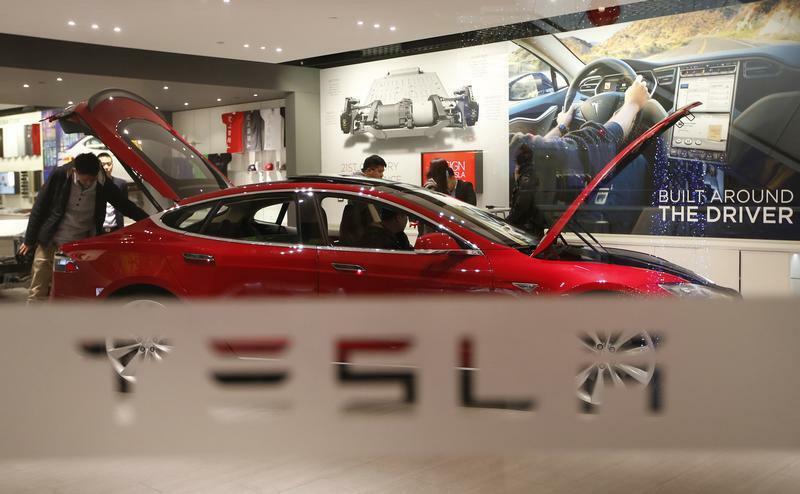 A man looks around Tesla Motors' Model S P85 at its showroom in Beijing January 29, 2014. Tesla Motors said on Feb. 26 that it intends to raise $1.6 billion from selling convertible bonds. The deal will be split into two equal tranches, the first with a 2019 maturity and the second with a 2021 maturity. Conversion and interest-rate terms have not yet been set. Buyers, however, will be able to convert the securities once Tesla’s stock price has traded 30 percent above whatever the conversion price ends up being for at least 20 trading days. Tesla can choose whether to convert the securities into common stock or cash – or a mixture of both. Tesla will use the proceeds to help pay for the development costs of both its planned battery factory and its planned “Gen III” mass-market car.